CVJ3710 Bayou Front Outer CV Joint Kit. Front Outer CV Joint Kit. Save money by repairing your axle rather than replacing it. Kit includes CV Joint, Boot, Bands, Clip and Grease Pack. 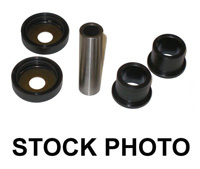 King Pin Kit includes all bushings, pins and seals needed for repair one side. 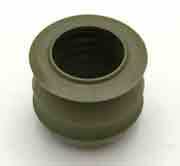 Quality aftermarket lower ball joint for Kawasaki. Saves you the cost of replacing the entire knuckle. 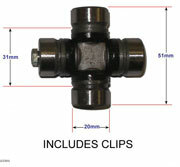 KP305 Kawasaki Brute Force/Prairie Ball Joint Kit. Ball Joint Kit includes the snap ring and cotter key. Measurements: 33mm body diameter, 10mm flange to snap ring, 70mm long. Each Lightning-Boot kit comes complete with a Lightning-Boot, Two stainless steel clamps, CV grease, hex banding tool, and detailed instructions. Aftermarket Lower Ball Joint for Kawasaki. Quality aftermarket ball joint for Kawasaki KLF300 2X4. Save big bucks over OEM prices. Why pay $400+ dollars for the complete front half shaft when you can repair the one you have by replacing the outer CV joint. This high quality CV joint kit includes the CV Joint, boot, grease pack and bands. 3010 Diesel B1-B34010 AllReplaces outside joint on 59266-0034 and 39158-1102. Mule 610 (all) 05-09Replaces the Outboard joint on 59266-0006 and 59266-0039. XCVJ3717 Brute Force Rear Outer CV Joint. Rear Outer CV Joint Kit. Save money by repairing your rear axle rather than replacing it. Kit includes CV Joint, Boot, Bands, Clip and Grease Pack. Why pay $400+ dollars for the complete front half shaft when you can repair the one you have by replacing the Inner CV joint. Mule 610 (all) 05-11* Replaces inboard front CV joint on 59266-0039 and 59266-0006. Why pay $400+ dollars for the complete front axle shaft when you can repair the one you have by replacing the inner CV joint. 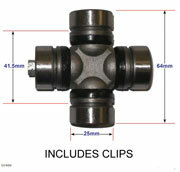 Universal Joint for Kawasaki KLF300C 4X4 Rear Final Drive Shaft. This is a CV Type Joint, includes boot and grease. Front OUTER CV Joint Repair Kit for Kawasaki. Front Inboard CV Joint Repair Kit for Kawasaki. Front INNER CV Joint Repair Kit for Kawasaki. REAR INNER CV Joint Repair Kit for Kawasaki. 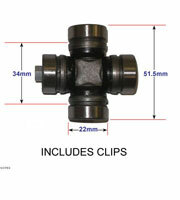 Universal Joint for Kawasaki 4X4 front propeller drive shaft. Includes clips. 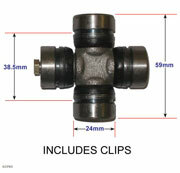 Universal Joint for Kawasaki 4X4 drive shaft. Includes clips. Universal Joint for Kawasaki rear drive shaft. Cap 22mm, Cap-Cap 51.5mm,Grove to Grove 34mm. 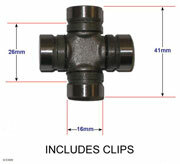 Universal Joint for Kawasaki 4X4 Rear Final Drive Shaft. Includes clips. Universal Joint (Spider) for Kawasaki Mule rear drive shaft.